This sandwich recipe is an upgrade on the classic BLT. By combining our KRAFT Italian Zesty Lime Dressing with an avocado, you can have guacamole in minutes! Spread it on this bacon and chicken sandwich for a surefire hit! Mash avocado with dressing in medium bowl. 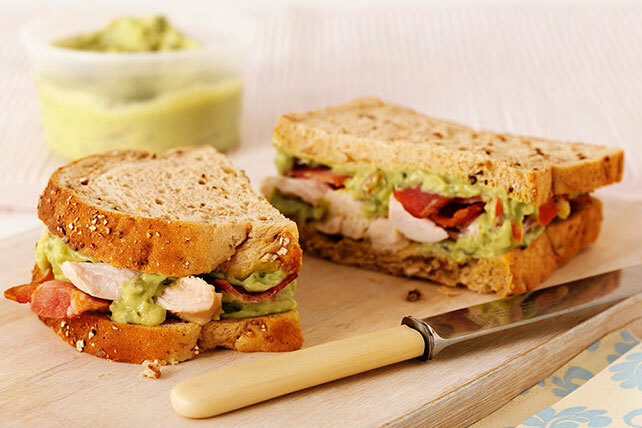 Spread guacamole mixture onto 2 bread slices; top with chicken and bacon. Cover with remaining bread slices. For added juiciness, add some sliced fresh tomato! To speed ripening of an avocado, place in a paper bag with an apple or banana. To slow down ripening, refrigerate for up to two days.